According to the current EU regulation it is mandatory for all X-ray operators to be certified on a regular basis in order to ensure high competency when working with X-ray imagery. 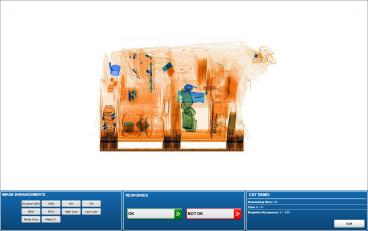 The X-Ray CAT provides a reliable and valid certification tool fully in compliance with the EU regulation 2015/1998. The X-Ray CAT was developed according to the EU regulation (EC 300/2008 and EC 2015/1998) and can be used for official certification of X-ray screeners. 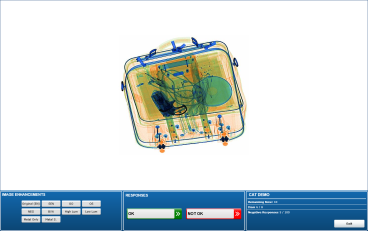 Developed by former X-ray operators and psychologists in close collaboration with aviation security experts, it meets the claim of both being in step with operational experience and fulfilling high statistical quality standards. The images for the tests are handpicked based on scientific criteria and go through a series of pre-tests in order to adhere to the highest standards. This results in excellent reliability coefficients with high Cronbach’s Alpha (>.85) and split-half values (>.85) which guarantee highly reliable test results. The examinees are guided through the test by clear instructions and with a series of integrated exercises. This provides a fair and objective test environment with comparable results. Thanks to the feature of immediate feedback, the administrator spots directly after completion if the examinee passed the test. The tests contain a wide-ranging selection of representative X-ray images, whereas, by default, half of the images contain prohibited items. This is the ideal relation for statistical purposes. Upon request the number of threat items may be changed in order to meet individual requirements. Our unique merging algorithm allows for the production of a large number of images and also enables a precise and flexible control over the difficulty of the images. In order to make the test as realistic as possible, we integrated all common image enhancement functions to provide the same viewing conditions as the security officer would have at the checkpoint. 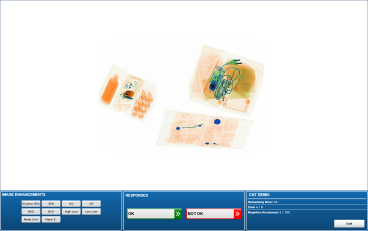 Additionally to its function as a certification test tool, X-Ray CAT offers the option to use it as a tool to determine individual weaknesses of the security officers. This performance benchmark based on the X-Ray CAT may also be established nationally or even internationally to discover potentials for improvement on a larger scope. 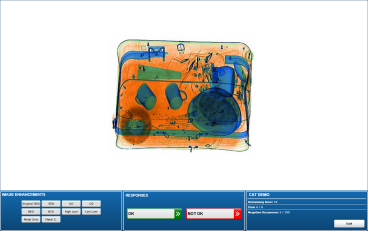 CThe X-Ray CAT is available in different test types for various fields of application such as Cabin Baggage Screening (CBS), Hold Baggage Screening (HBS), cargo, mail and in prison environments. On request the tests can be customized to individual requirements. The tests are validated and updated regularly to adhere to the latest standards of X-ray image quality and to comply with the official regulations. The cargo test contains a broad variety of IEDs made with different types of explosive material, object shapes and detonators. This test contains a broad variety of IEDs made with different types of explosive material, object shapes and detonators. This new test features letter and parcel IEDs as well as general IEDs that are only inserted in logically suitable conditions. This test contains a broad variety of guns, knives, IEDs as well as prohibited items in prison environments (e.g. cell phones). 1. Is the X-Ray CAT compliant with EU regulations? Yes, the X-Ray CAT incorporates all criteria recommended by the ECAC. 2. What are the advantages of the Competency Assessment Test compared to real-tests? Most importantly the X-Ray CAT provides reliable and valid test results. Getting reliable test results using real-tests is much more difficult. Furthermore, it is more efficient than real-tests, because more security officers can be tested at once. Work-time and effort, which are needed to test many security officers, are much lower. Additionally, a security officer can be tested with more threat items than during real-tests. However, real-tests are important and should not be replaced by the X-Ray CAT. Both methods should be executed complementary. 3. How many images must be evaluated within the X-Ray CAT? It depends on the test version (CBS, HBS, Cargo, Mail, etc.). Normally the test includes between 160 and 256 images. 4. How long does it take to complete the X-Ray CAT? 5. Is there a demo of the X-Ray CAT available? 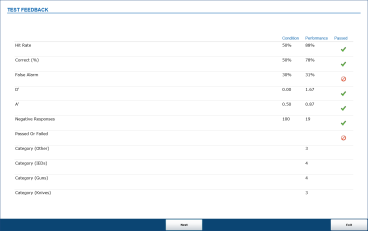 Yes, demo versions of the different tests are available. Please contact your sales partner or CASRA in order to provide you with login credentials.